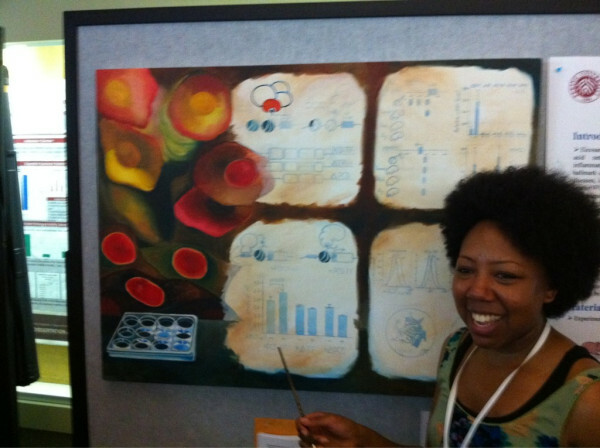 Karmella Haynes, had hand painted her poster on canvas. Drawn in by the art, I went to talk to her (well, first I said “This is awesome” or something like that. And then I found out a bit more detail. She had her paints with her and was continuing to add touches to the painting. Though I was fascinated by the art side of this, then we got to talking about the science because actually – the figures there were about work she had done on applying some ideas from synthetic biology to animal cells in tissue culture. And then with a little help from Google I discovered her openwetware page: Karmella Haynes. And from that I found her art page: http://www.karmellahaynes.com/. 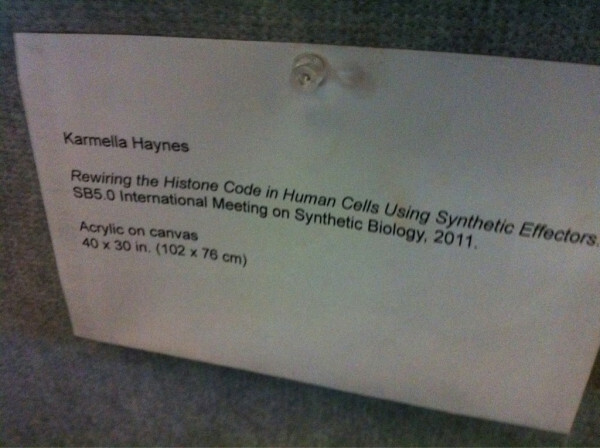 I hope she does more hand painted posters for conferences – it certainly brightened up the poster session and made my day. Author Jonathan EisenPosted on June 16, 2011 April 10, 2017 Categories Misc.Tags Misc. A nice reminder that art goes hand in hand with science – art is really important for the analysis and synthesis of ideas.